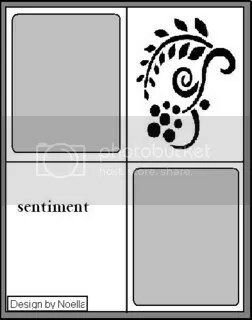 We would love to see what you can create with these three card sketches. We will choose a winner from all entries and you will win a prize from SBCH! The winner chosen will then get to design an example from one of my sketches for one of the future blog sketch contests. The deadline for the contest is Monday May 12th. A winner will then be chosen on Tuesday May 13th and I will post another sketch contest on Wednesday May 14th. Scrapbooker’s Club House will continue to hold this contest biweekly. We hope you will give it a try! 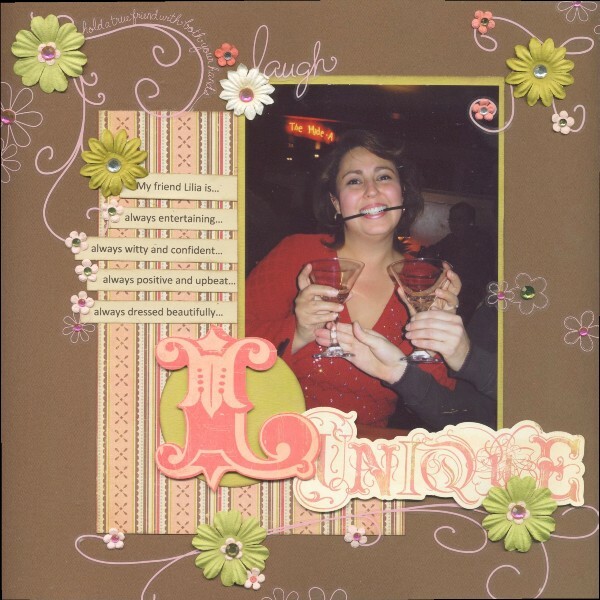 When you have completed your Layout you can post it in the “blog contest” gallery or e-mail to me at noelmika@nb.sympatico.ca or Nicole at nicole@scrapbookersclubhouse.com. Please be sure to also name your entry with “Blog Contest #14” either in the title or description in the gallery. Finally, This contest will remain as a blog contest and not be announced on our forum, so make sure to stay tuned regularly and check our postings daily. Alright gals.. I have changed it up and decided that we needed to make cards based on these three sketches..here are the sketches and awesome interpretations. Yahooo! There’s gona be a party! Scrapbooker’s Club House invites you to celebrate National Scrapbooking Day with us! The Design Team has a WHOLE WEEKEND of fun challenges planned May 3-4, 2008. Come join in the fun; you’ll discover a friendly place where you want to hang out! 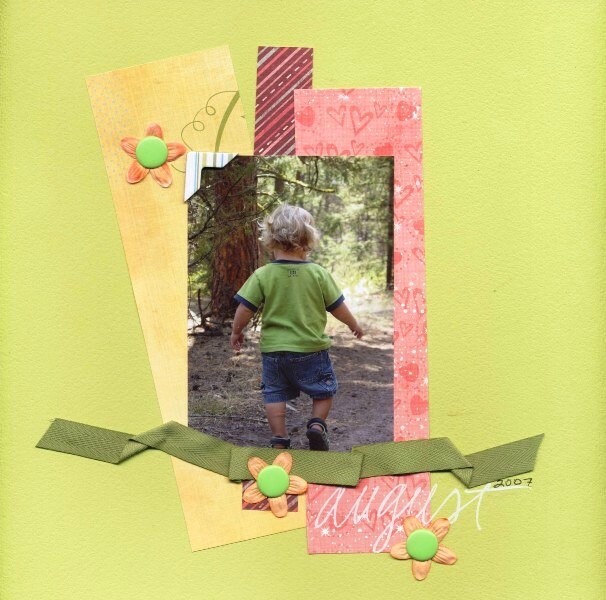 Our theme for the weekend will be “Scrapbooking Trends” and is sure to inspire you in the creation of some SMASHING layouts! There will also be a fantastic prize draw to cap things off! Grab a friend and come on over to the Club House! We’re waiting to welcome you! Trina!! for this awesome interpretation of the sketch! Stay tuned for tomorrow’s new sketch contest featuring another sketch and an awesome interpretation from another awesome designer..you don’t want to miss this one! SBCH Spotlight – Design Team Member- Heather! Our SBCH Spotlight – Design Team Member – Heather! Hi. I’m Heather Hopkins. I’m in love with my hubby of 20+ years, Rick, my twin 13 yr old boys, Duncan and Daniel, and my little girl Breanna, who’s 9. Also a big part of our family is our lab/husky cross, Tikanii. We all live in Northern BC where the winters are way too long and the summers far too short but the country is spectacular whatever time of year it is. I’ve been scrapbooking for about ten years now. My Mum got me started when a friend of hers became a CM consultant. I love to scrapbook. I just do! There’s nothing more satisfying then having a page come together. And then enjoying that page over and over again… and watching my children relive and enjoy the memories. Love it! I truly do. I enjoy the creative aspect of putting my memories down on a page with patterns and colours and all kinds of embellishments and journaling our stories. I feel so lucky to have discovered this hobby. It has truly become a passion for me. When I’m not scrapbooking I enjoy reading, coffee and chit chat with my girlfriends, and taking care of my family. If you want to see more of Heather’s work, make sure to come and see her Design Team Gallery! “Technique Tibit Thursday” – Glimmer Mist! Alrighty ladies! Are you ready for some awesome techniques which will be available to you every Thursday? 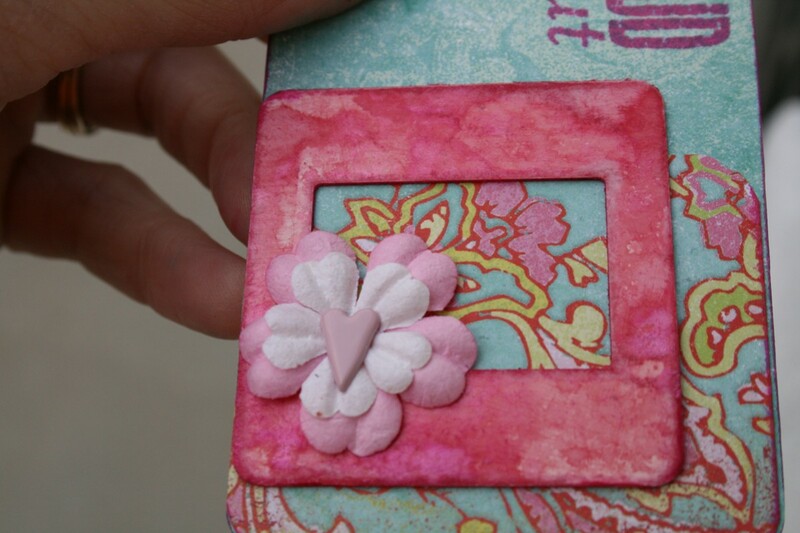 Well look no further, because we will have a new technique shown every Thursday right here on the Scrapbooker’s Club House Blog! Each Design Team member will give us a how to on different techniques. How cool is that? Our first technique is a “How to on Glimmer Mist”. The Designer showing us examples and instruction on this technique is Scrapbooker’s Club House Designer – Mara! 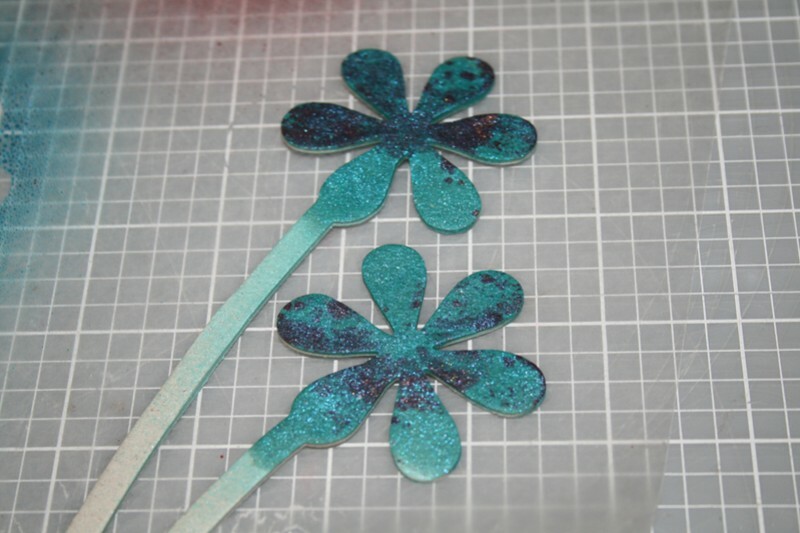 Glimmer mist is a fun product to add some glimmer and shine to your layouts and projects. It’s made by Tattered Angels and comes in a huge variety of colors. I’m going to show you a few techniques to get started with this fun product. 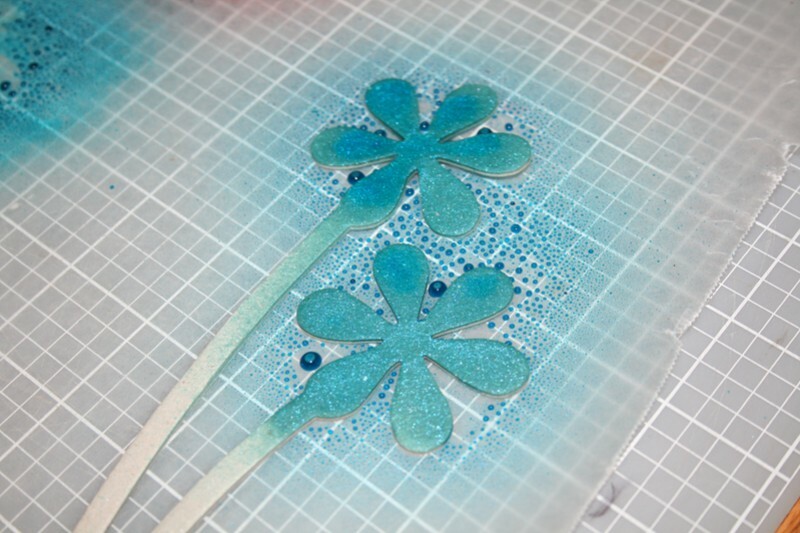 Spray the chipboard with the glimmer mist, don’t be afraid to use it! Let your chipboard dry a bit, you can use a heat gun to speed up drying time. Add as many layers of glimmer mist as you like, more glimmer mist will give a more intense shine and color. You can now use this on your layout. 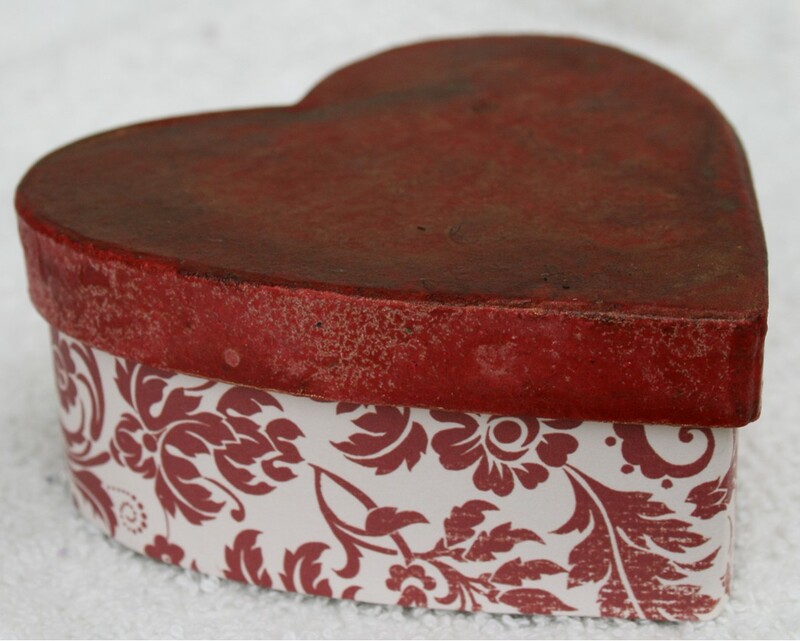 This gives a fun combination of color on your chipboard. Now use the chipboard on your layout. 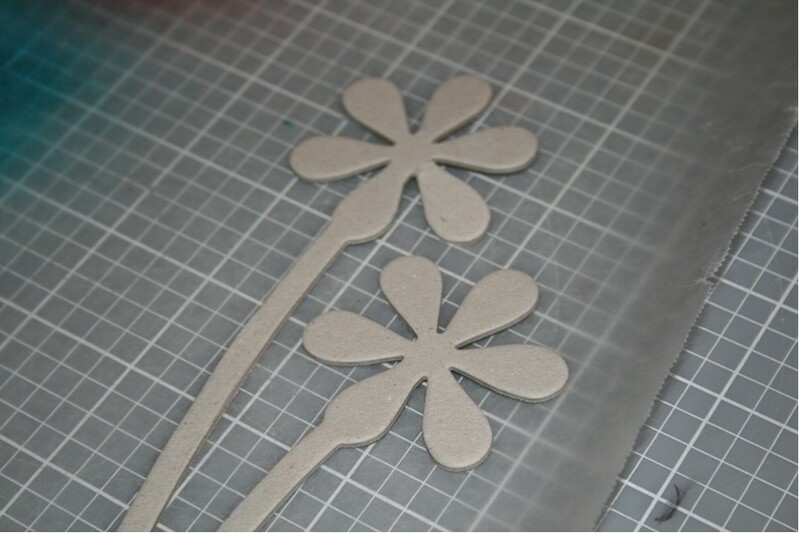 Using glimmer mist with paper is also a great way to give your project a shine. 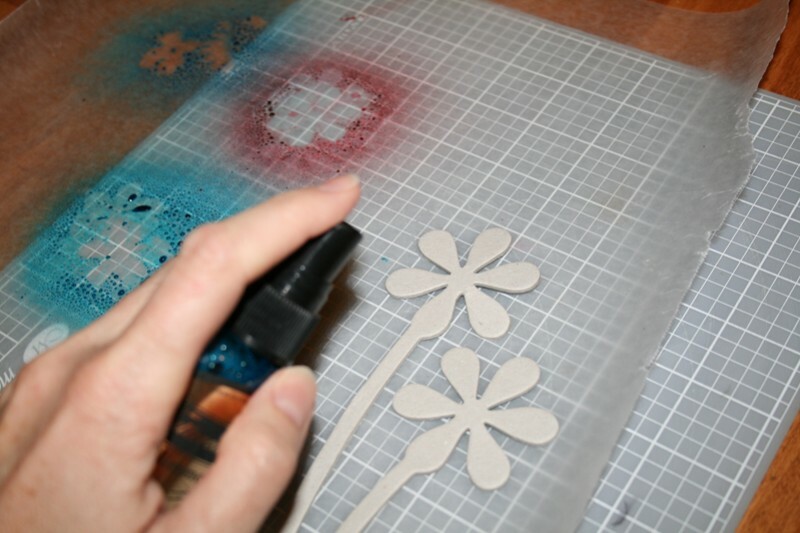 Avoid using thin patterned paper or cardstock, as the glimmer mist can warp the paper a bit. 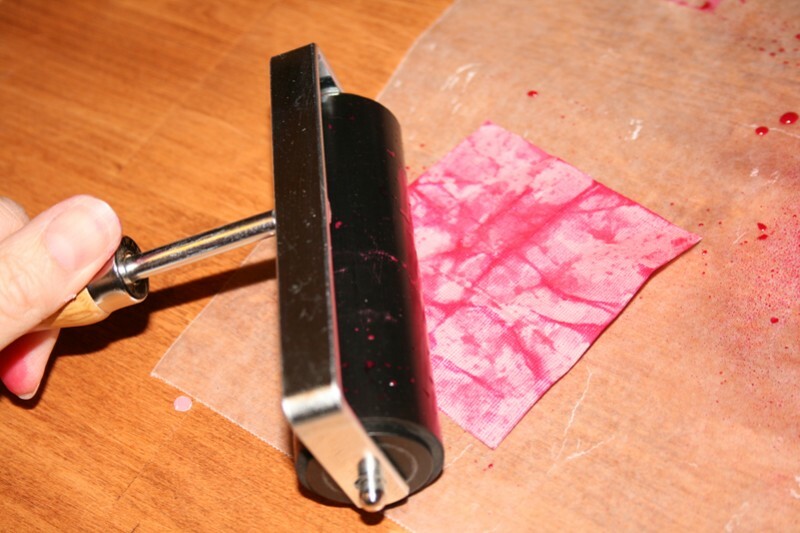 For this technique, I’m using a brayer and a heat gun. 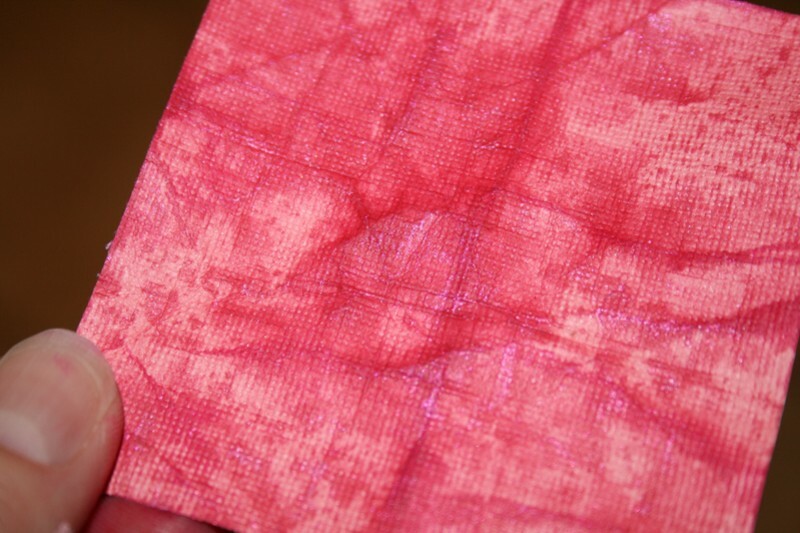 Place your cardstock paper on waxed paper. Spray generously with glimmer mist. 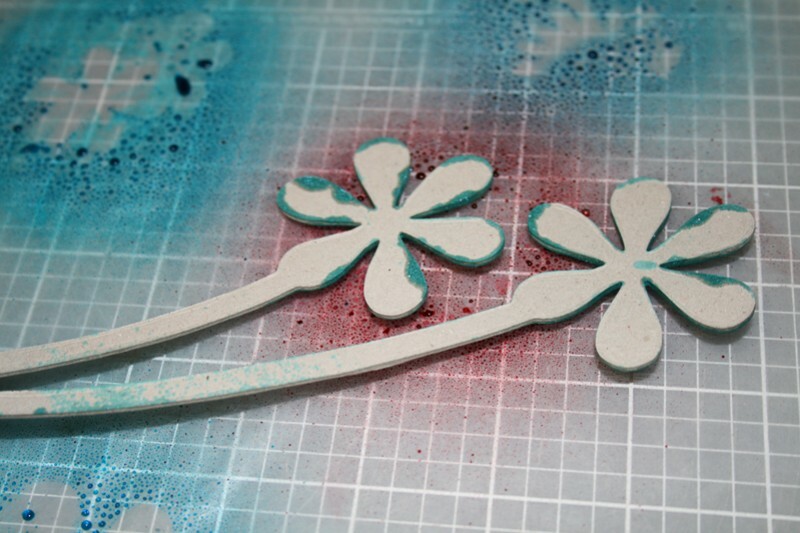 Use the brayer to spread the glimmer mist over the paper . 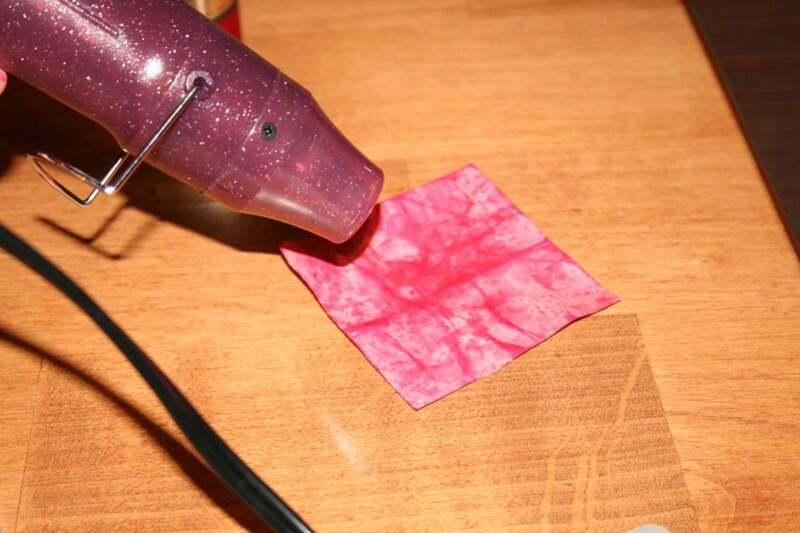 Dry with the heat gun. 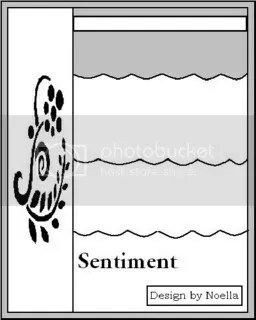 Again, you can add as many layers of glimmer mist as you want before achieving the desired look on your paper. 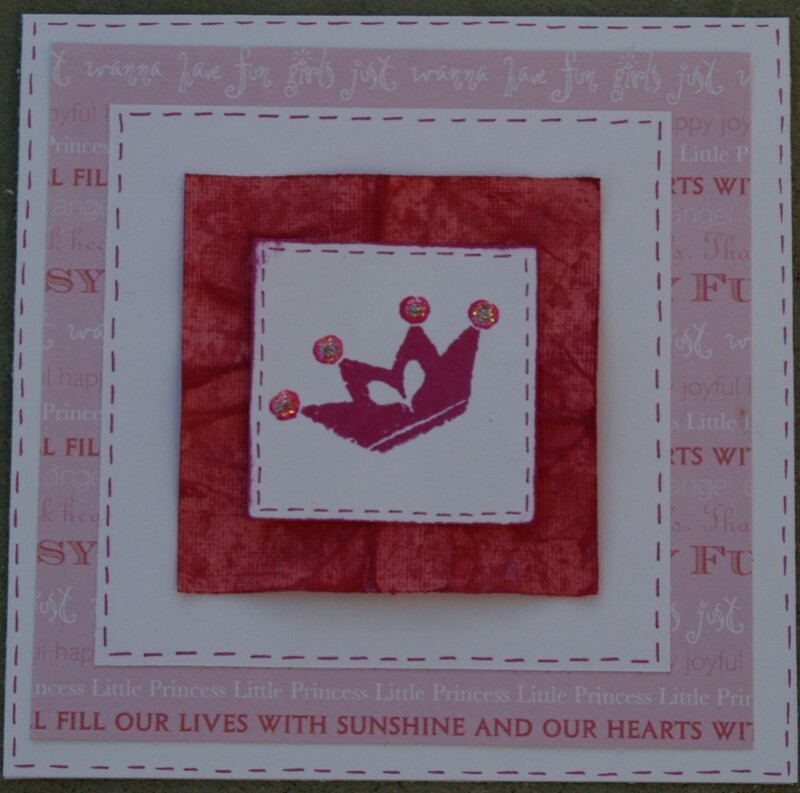 I used this piece of cardstock as a layer for a princess card, give it a bit of bling! 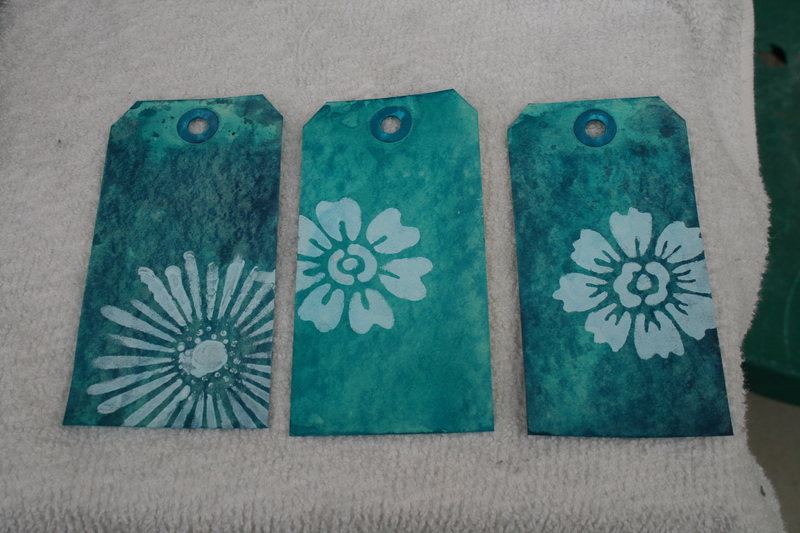 I’ve used glimmer mist on blank shipping tags using the same mist + brayer + heat gun technique. 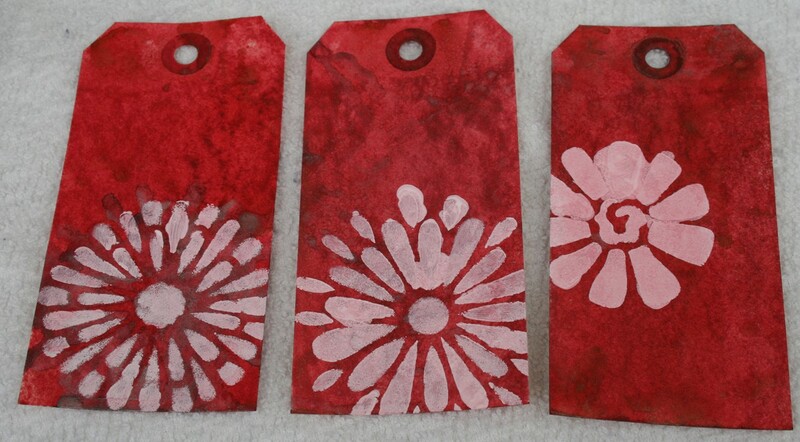 I then used a plastic stencil and acrylic paint to create a flower on my tags. 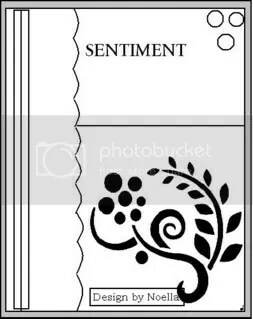 This could be used on a layout, as gift tags, or a cool mini album! I hope you enjoyed this weeks “Technique Tidbit Thursday Tips”…Please join us every Thursday for more awesome techniques!